I don’t have a lot of clear memories of anything that happened in my pre school years. I know we played outside a lot since we had few toys and a lot of yard. We also had a great deal of imagination! I remember playing at my Dad’s cousin’s house. I had only boys in my neighborhood to play with. There was only one other girl and she had a vocabulary that would make my Dad blush so I could not get that past my Mom. They had to let me play. My Dad built a backstop on one of our lots for all of us to play ball on. My brother did not allow them to play unless I could play, however, I never saw anything but outfield. I don’t recall if it was because I was a girl or because I was not a great athlete. I vividly remember picking on my brother. I really cannot understand why he is still speaking to me because I was a real pain. I would tease and run. In my defense I will say it was more fun than playing with dolls. I remember one of my favorite activities was listening to my Mom playing the piano. She taught me one song and I can still play it. That is amazing since I have no talent and do not even read music. 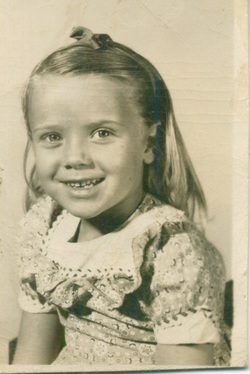 I do remember being very happy and content as a child. That feeling of contentment is more important to me than almost anything else because my parents proved that you do not have to have money to have happiness. 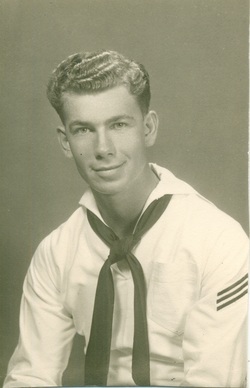 I was very young when my oldest brother joined the Navy. For all of the years I was growing up he was gone. I have very strong memories of how exciting it was to prepare for his visits home. Often he brought his buddies. We worked hard to have everything ready and it was a special time in our lives. It did not happen often enough. He was overseas a lot of my growing up years and even though I loved him we really did not know each other. I was also preschool when my sister was married. Her oldest child was 5 years younger that I was. I more or less grew up with her kids and I remember liking them a lot more when I visited them at their home. When they were at ours they liked to play in my room and that was a lot to handle for the baby of the family. I was not accustomed to anyone taking over my area. My clearest memory of my grade school years was Kindergarten. I mainly remember the back of the piano. That was where you had to sit if you would not quit talking. For those of you who know me well it will be hard to believe but I spent a lot of time there. I was a Lincoln Elementary Tiger!!! I remember walking to school and if the weather was bad Mom would walk us to school then walk home because she was worried we would go too slow and freeze. There was a little bitty store between home and school that we could stop and buy a penny candy on the way home if we managed our money well. My Dad was not a great communicator but I always felt safe when he was there. I never had a doubt that he would protect me. He was also easier to talk into things than my Mom. That, for a child, was an important piece of information. My Mom was the patient one and always willing to teach but she had a core of steel once she had taken a stand. Begging, whining and pleading did not work with her. She was not a strict or unreasonable person but once she made up her mind it was set in stone. I never felt that I lacked anything. We did not have much but my parents were hard workers and I always knew we came first. I was in junior high before I realized that everyone did not have clothes made from feed sacks and decorated with rick rack. I was surely proud of mine. I remember very clearly when I learned to drive. I was SO excited. My brother was much more patient than I was and my parents were not in any hurry to give driving lessons. When I became driving age he was waiting patiently to be taught. Patience has never been my best thing. I started my “teach me or listen to me till your ears fall off” campaign. It worked and my Dad took us out to teach us. I learned one thing from that lesson. If my Dad and I were to have a relationship he would NOT be the one to teach me. He had little patience and I required a lot. I turned my campaign on my older sister. She found an abandoned air base close to home and took us there and that is where we both learned to drive. All of this led to just my partner in crime and I attempting to finish raising our parents. We did try but we all know that raising parents is a difficult job. The next few years seemed to fly by and the next thing I knew my brother had graduated and left for the Navy. That would make a number of changes in my life. We moved to another house, I was in the last part of high school and boys were so interesting. The really cool gifts that arrived from other countries were a good consolation for suddenly being an only child . Front row Martha Wilcox Rowley, Dale Rowley, Carol Wilcox. Back row George. Ivo, Ruth, and Harold Wilcox. It was not a lot of years later that my oldest brother (sitting to Dad's right) returned to Dodge City to live and since we had been so far apart my whole life it was a chance to get reacquainted. 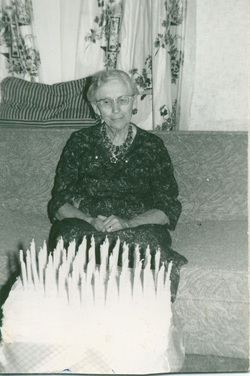 During my high school years my Grandma Wilcox split her time between living with my parents and her other son. Mom was always a caregiver so a lot of her time was spent taking care of her. She was in her 90’s but I can’t remember the exact age. Whenever I had been out with my friends she would always come to my room and want to know exactly what we had been doing. She would say “You can talk to me. I am not one of your parents.” I considered making something up just to see what she would say but changed my mind after some thought. During my college years there were several of my class mates that were far away from home. Mom, Dad and I started a Friday night spaghetti feed. We would get together and eat then play games all evening. Mom and Dad clearly were important in their lives and they kept in touch for years after. After college I got married and moved to Wichita. I was very blessed because by then my parents were retired so when the babies came they were there to help out. They were just under 40 years older than I was. They loved playing with the babies and I valued the help. Large bowl purchased from Jewel T. Sometimes called the big bear. During all of my life any time there was a family dinner this bowl was on the table filled with jello, fruit and marshmallows. Good stuff!! Mom’s fried chicken was a favorite that the kids could hardly wait to taste. Every Christmas the kids would get two things from Grandma and Grandpa. It was always homemade. Something from Grandpa’s shop and something else from Grandma’s sewing machine. It was always fun for the boys to visit. Grandpa would set them up to “make” something in the shop. Always a new memory from every visit. 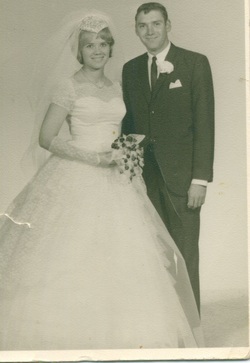 During their lives together my parents celebrated their 50th and 60th wedding anniversaries. My Dad passed away shortly after their 60th. My Mom made all but one of my son’s graduations and all of their weddings. Family was the most important thing to her. My Mom loved to write. She wrote poems, stories and letters that were always “keepers”. We were left such a legacy with her writing. Except for vacations to visit others my Mom lived with us her last 8 years. We traveled quite a lot. We went to her alumni banquets. The last year we went she said she was not going to go back because she knew more people in the cemetery than at the banquet. They were always in May so we decorated family graves in the same visit. We went on trips to visit family in various little towns mainly in eastern Kansas. Some family was too far away for the two of us to make the trip. She really loved those visits. Mom had the best memory I have ever seen. When you add that to the silliest sense of humor ever it made for some really memorable conversations. She loved watching people and whenever we would go to Walmart or any other large store she would always want to sit in the front of the store to see all the people that went through while I shopped. She could make conversation on that for days. She spent hours making latch hook pillows, rugs and wall hangings. She always said if her hands and mind were busy she was fine. She enjoyed visitors so we had as many parties as we could work in. 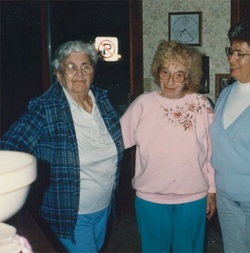 My friends and neighbors were always up for a visit with Mom. That woman could carry on a conversation with a brick wall. After 30 minutes she would have your whole life history and you gave it willingly. She really enjoyed being part of a day care. She would read to the children and watch them play for hours. I asked her once if the noise bothered her and her answer was “If they get too loud I will just turn down my hearing aid”. Each year Santa would visit the children. She loved that. Each year he would stop and talk to her and ask her if she had been good. The author is more responsible than anyone for the good health and safety of the last decade of her mother's life.